Dive Journal: Since it is a fairly lengthy boat ride, Captain John seems a bit hesitant to try the other manta channel, but he eventually decides to go for it. We spend the long boat ride getting further acquainted with Heinz from Switzerland, Jennifer, a recovering New Yorker, and Robert, an Air Micronesia pilot stationed out of Guam. We ask Heinz what he does in Switzerland. “I am Swiss. What do you think I do?” say Heinz, almost proudly. “Uh...you make chocolate?" Linda asks. Much laughter onboard. Heinz sighs. “Cheese?” asks Linda. Even more laughter. “Banker!” offers Rich, and Heinz nods. “Not a clockmaker, then?” quips Linda, grinning. The entire boat is laughing and Heinz does too. We pull eventually into a channel around the northwest end of the island, thread between several buoys there, and begin preparing for the dive. Our descent takes us over some shallow pinnacles with an interesting dark green plant or soft coral growing. I immediately begin shooting video, and get absorbed with the smallish stuff in my viewfinder. Glancing at Linda, I see that she is emphatically motioning to something over my shoulder. Before I even have time to turn, I instead see the huge and graceful form of a manta ray emerge from the cloudy water behind Linda, and I motion back to her. AWESOME! The manta flies very slowly through the water, and barely a push from its massive wings propels it gracefully across our field of view. We are simply dumbstruck as the beautiful creature glides over us. We continue to slowly fin our way into the channel, and then take up a position partially up the channel side crouched between some boulders. 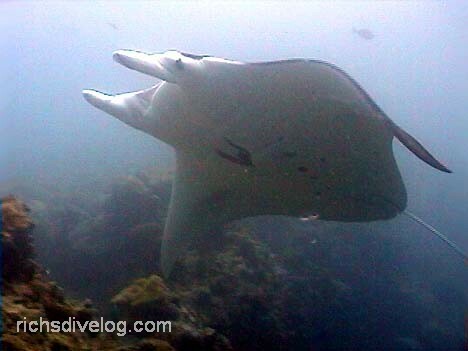 We sit and wait, but not for very long and we are treated to another magnificent manta ray passing in front of us. I literally hold my breath in awe while I pan the video camera with the ray. While we are perched here, about 50 feet deep, the entire group is treated to at least a dozen more manta “flybys.” It is difficult to tell how many unique manta rays we’re seeing, but the parade of them is just great! Also notable on this dive were the fairly numerous white tip and grey reef sharks early in the dive, and a half dozen or so titan triggerfish aggressively protecting their turf in the channel bottom. Linda and I both eventually rose on this dive due to decompression needs, and we actually enjoyed several more manta passings in about 20 feet of water while offgassing a bit, affording us a different view. Great dive – a reason we came to Yap! We were later pleased to learn that Liz snorkelled on this dive and saw the mantas, too.